The conversion of the Interstate 395 High Occupancy Vehicle lanes to High Occupancy Toll lanes from Edsall Road to the Pentagon is going full speed ahead. Starting next week, drivers will begin noticing new tolling technology above the express lanes north of Edsall Road. 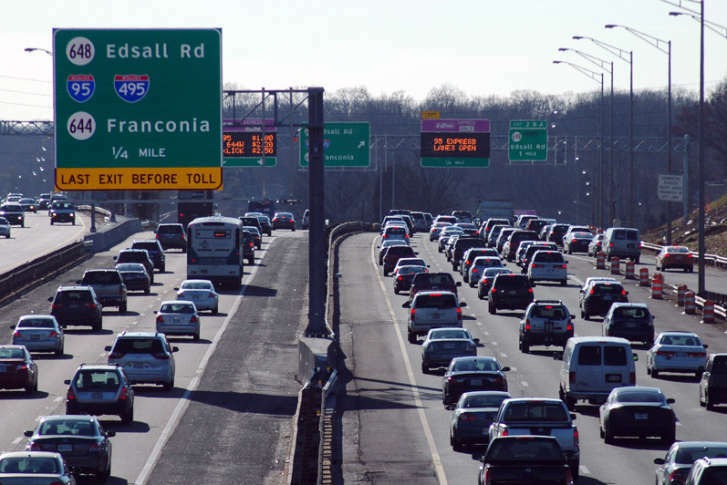 “Monday morning, drivers will see new cameras and E-ZPass readers on the gantry structure that hangs over the 395 HOV lanes right around Edsall Road,” said Mike McGurk with Transurban, the operator of the facility. “We don’t want drivers to be confused: tolling hasn’t started yet, E-ZPass is not required yet and the HOV rules of the road remain in effect.” McGurk said the installation and testing of the technology on the remaining gantries in the I-395 HOV lanes will continue throughout the spring and summer. More gantries and devices will be installed during the weekends throughout the spring and summer. Most drivers are used to the weekend-long closure of the express lanes for this project which began in 2017. Although the impacts from this necessary closure were minimal during the colder winter months, the last several weekends have featured significant northbound congestion near the 14th Street Bridge. As cherry blossom and baseball season nears, the closure is putting more stress on inbound traffic in the main lanes. The express lanes operate continuously, both ways, between the Pentagon in Virginia and “Lower” 14th Street in the District. The weekend closure of the express lanes sometimes blocks both the reversible lanes and the dual carriageway north of the Pentagon into Washington. That has led to major backups on Saturday and Sunday afternoons of late. Another full express lanes closure for I-395 is on tap this weekend as the cherry blossoms near peak bloom. It’s worth noting that upriver, the Arlington Memorial Bridge is also operating with reduced capacity during its multiyear rehabilitation project.